Although I have long incorporated open educational resources into my teaching predominantly so that students would not have to buy expensive textbooks, I haven’t until recently considered this to be foundational to my pedagogical approach in the university classroom. Having learned much over the past year, I now consider that incorporating open educational resources not only saves students money, but also contributes to the accessibility of the university and the democratization and decommodification of knowledge. Open educational resources are those which are licensed in such a way that they are available for free for use by students and teachers. Many of these resources are also licensed such that with attribution they can be modified and customized. BC Campus has a list of such resources which is growing daily. Using open resources acknowledges the communal nature of knowledge production and resists attempts to commodify what should truly be held in the common good. We also know that students will sometimes not enroll, withdraw from, or not purchase the readings for courses that have significant text costs. Textbook costs are a serious hindrance to the financial accessibility of the university, but the adoption of open educational resources in BC has saved students about $8million since 2010. Kwantlen Polytechnic University recently announced a suite of courses with zero textbook costs called “Zed Cred.” I’m thrilled that many of my courses will rely completely on open resources as part of the Zed Cred suite. Finally, I’ve recently moved to a “paperless classroom,” which means that all course documents are exchanged via the course management software used by the institutions where I teach. I was concerned that this would make grading more difficult or tiresome, but in fact it saves time with things like tabulations and keeping track of late assignments. Likewise, I need no longer carry around bags and bags of paper, and don’t have to worry about where I will store piles of assignments for the few years we are required to retain them. Plus, this obviously reduces the environmental impacts of paper, printer, and ink manufacturing. 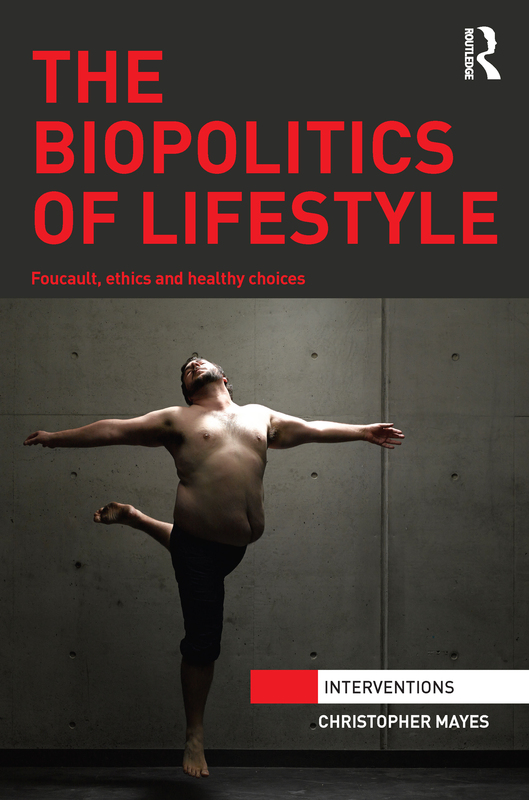 What is especially productive in Biopolitics of Lifestyle is the clever disavowal of worn debates about the ethicality of, or personal responsibility for, fatness. Instead, Mayes reveals what he calls an “enabling network,” or intersections of knowledge, power, and subjectivity, which renders people who are supposedly harmful to society visible and governable. The enabling network makes “obesity” a major social, political, and economic problem, locates responsibility for harms caused by fatness in individuals, and simultaneously hides structural forces that contribute to corpulence. As such, “obesity” is a means by which members of society can be molded and disciplined in the service of state or capitalist interests. This is a worthwhile book and the front cover artwork is wonderful. In a globalized landscape, where threats of infectious disease outbreaks, bioterrorism, and natural disaster seem omnipresent, how do we (as communicators) translate scientific knowledge into actionable information for diverse publics? While “common sense” assures us that we simply need to deliver “the facts” in a comprehensive manner, what happens when scientific evidence is uncertain, controversial, or even suspect, to some of its most affected populations? How are these issues mediated and transformed through the ubiquity of new information and communication technologies (ICTs)? This course examines the relationships between communication, science, technology, and public policy in the evaluation and management of risk. After introducing key theories, concepts, and problematics, each week will examine a different case study of risk and communication. Topics include: vaccinations, nuclear waste, HIV/AIDS, antibiotic resistance, tsunamis, and obesity. This case study approach will inform the final project, where students will work in teams to develop a podcast about a topic relevant to risk communication. Reproductive politics refers ongoing struggles to define, constrain, medicalize, technologize, spur, and/or prevent reproduction. This is an introductory course that builds interdisciplinary and feminist tools to analyze narratives, issues, practices, and arguments regarding reproductive politics as they manifest throughout the lifecourse, from preconception to end of life. Topics include reproductive choices, fertility, non-normative kinship, childbirth, child rearing, menopause and andropause, and the developmental origins of health and disease. Recognizing the topical and controversial nature of reproductive politics as well as the role of GSWS in transforming students into critical advocates for social change, assignments encourage students to engage in public dialogues on reproduction and to develop programmes of advocacy to advance reproductive justice. If you are a prospective student and have any questions, please do let me know! I’ve got a new book review published in New Genetics and Society on Rendering Life Molecular: Models, Modelers, and Excitable Matter by Natasha Myers. I really enjoyed this valuable and thought provoking book! Thank you to Martyn Pickersgill for facilitating the review! Yoshizawa, Rebecca S. (2016) “Rending Life Molecular: Models, Modelers, and Excitable Matter, by Natasha Myers (book review).” New Genetics and Society. Reproductive politics refers ongoing struggles to define, constrain, medicalize, technologize, spur, and/or prevent reproduction. This is an introductory course that builds interdisciplinary and feminist tools to analyze narratives, issues, practices, and arguments regarding reproductive politics as they manifest through out the lifecourse, from preconception to end of life. Topics include reproductive choices, fertility, non-normative kinship, childbirth, child rearing, menopause and andropause, and the developmental origins of health and disease. Recognizing the topical and controversial nature of reproductive politics as well as the role of GSWS in transforming students into critical advocates for social change, assignments encourage students to engage in public dialogues on reproduction. This second year course, suitable for students who are both new to or familiar with feminism and reproductive politics, includes interesting assignments that encourage engagement beyond the university. If you have any questions about this course, please do not hesitate to contact me! Quick Comment: The Census is Important! 4 years ago I wrote about how the census is important. Now it looks like under Justin Trudeau, the long form census is back! This is excellent news. How can a society improve itself if it does not know itself? Here’s hoping the Trudeau government commits to more progressive changes… although in this case, it’s restoring what never should have been lost. I am pleased to report that I’ll be serving as a postdoctoral researcher in the GeNA Lab in the School of Communication at Simon Fraser University starting this month. The GeNA Lab investigates the social and organizational impacts of information technologies and communication networks and the turn to big data in a number of sectors including genomics and health, social media, and NBA basketball. We aim to disseminate scholarly outputs and policy work to an interdisciplinary community and engage broader communities and partners who are innovating digital technologies. I’ll be working in a collaborative manner on genetics, network, and society research. I’m excited to extend my expertise in science studies and biology to new topics in bioethics, surveillance, and health research!